A Bangor University alumnus will perform for the first time at the Edinburgh Festival Fringe this August. 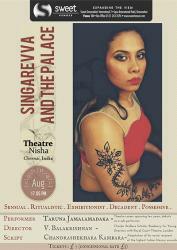 Taruna Jamalamadaka, who studied her Masters in Foundations of Clinical Psychology at Bangor, will debut as a solo performer in Singarevva and the Palace. Set in a village in North Karnataka, the play is the tale of a beautiful woman whose life is repeatedly commodified and manipulated by her greedy father, an impotent husband and an obsessive lover. Her desire to be a wife and a mother is never fulfilled, while she faces public humiliation for her supposed barrenness. A lifetime of disappointments and frustrations make Singarevva a bitter woman who finds her own way to exact revenge on her abusers. She said: “It was the quintessential room with a view with the Snowdon mountains just a curtain's draw away. The quiet and serenity that Reichel's top floor afforded was worth even putting up with the shared kitchen and bathroom facilities! “I can now look back with fondness at what was a tortuous everyday uphill walk from the Wheldon to Brigantia or back to Halls! Or the late night trips to University Kebabs for a pizza. And Mike's Bites for breakfast after a night out at Academi. Taruna has ten years of experience in theatre and works with an Indian theatre group, Theatre Nisha. Plays she has acted in include Sarah Kane's 'Crave', Albert Camus' 'The Misunderstanding' and Girish Karnad's 'The Fire and the Rain'. Singarevva and the Palace will take place at Apex International Hotel, Grassmarket, Edinburgh between 12th and 17th August.